TUHH welcomes many international students each year. Your ways to TUHH and your first contact may vary depending on whether you are an exchange student from a partner university, a prospective student interested in studying for a full degree at TUHH or whether you wish to visit TUHH as a non-degree student for a short stay to do project work or a research internship. The TUHH supports the National Code of Conduct for German Universities Regarding International Students. 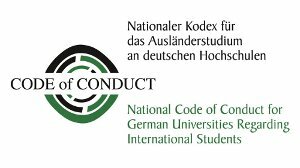 This Code of Conduct aims to ensure that students from abroad receive the quality of support and advice needed when studying in Germany. The guiding principle is, wherever possible, to grant international students the same rights as are available to German or EU students. Any non-compliance with the National Code of Conduct could be reported to Nicole Frei, Manager of Internationalisation at TUHH. Interested in undergraduate or graduate studies at TUHH? Need advice on where, when and how to apply? You have already applied and you have questions on the status of your application? For information on the status of your application please turn to STUDIS, the Admission and Registration office.